Well, don't these three make you want to run for cover? After grabbing a copy of each and tucking away with them somewhere warm and cozy, of course. I don't know, I think they each look spectacular in their own way and on this fall afternoon I'm feeling like something dangerous and uncertain. I've actually had my eye on this one for awhile now. Ever since reading an article about it in an Australian newspaper awhile back and being intrigued. Katherine Patterson's life is torn apart when her sister dies. After moving to a new town and a new school, she makes friend with a happy and vivacious girl named Alice and life begins to look up. But there are darker currents running through this friendship and not everything is as it seems. I really cannot wait to get my hands on this one. Just look at that cover. And that title! It calls out to me, you guys. It does. Details are few, but it appears this historical mystery is about a young girl whose mother has died and whose father is home from the war and struggling to start a detective agency. His daughter sets out to help him and mystery ensues. Looks like this one will be the first in a series as well. Yay! Gotta love the concept for this debut dystopian. Set in the year 2150, Nina Oberon is approaching her sixteenth birthday with more in the way of trepidation than jubilation. Everything changes when you turn sixteen and get the tattoo marking your status. Then nothing is safe. Meanwhile, Nina's mother is attacked and she's sent searching for a father she was certain was dead. You can read the first chapter here. Beautiful Malice has a look that really grabs you. 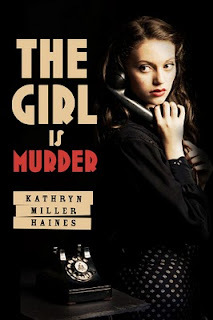 I also like The girl is Murder because it has a very classic and vintage feel. Great choices! Ive got Beautiful Malice on my TBR Pile and Waiting for my copy of XVI to arrive and The Girl is Murder looks like a good read Ill have to add to my list. It's like a historical Veronica Mars! I'm in love already! XVI looks like it will be an interesting (but slightly disturbing) read. I'd not heard of the other two but am going to keep track of them for sure! Cari, yup. Love that vintage feel. I can't wait to find out more! Phantom, hey, welcome to these parts! We're happy to have you. 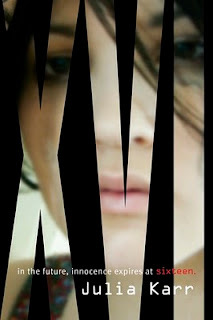 I can't wait to see what XVI is really like. It sounds wild. In a good way. Donna, exactly! Win, win, win! Michelle, definitely disturbing. 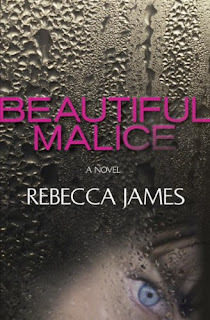 I think BEAUTIFUL MALICE will be as well.